I am very very slowly sorting through some 45s from Benin, and these two have certainly caught my attention. So I thought I would share them with you, in the series of posts of 45s. Both are by El Rego. 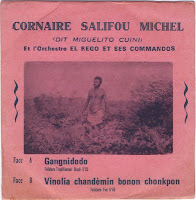 The first with "son ensemble typique", and the second with his "Commandos" and singer Cornaire Salifou Michel, who according to the cover is nicknamed "Miguelito Cuini", - but I expect they meant to write Cuni, like the great Cuban sonero of Chappotin's Estrellas*. You can read more about Theophile Do Rego, better known as 'El Rego', in this post on the Radiodiffusion blog. As you can hear, both records have suffered as a result of time, dust and wear, but I think the essence is still audible. 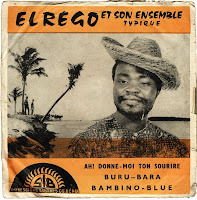 The 'El Rego et son ensemble typique' single features an extraordinary collection of curiosities, from a somewhat pretentious blues track with a solid dose of late-night ambiance (I get drunk just listening to this...) on the A-side to a version of "Donnez-Moi Ton Sourire" (which you may remember from this memorable Ivorian collection) plus an initially almost unrecognisable version of the hit of Cuban tourist bars "Buru Barara" on the B-side. The second single is from a later date (but what?). This is one for the organ lovers, and more particularly of the close-to-the-edge organs (like me). On both sides the rhythms appear to be of Beninois origin, and the orchestration is rich, with some nice horns (especially on the B-side). For experts of the music from Benin, like Oro (loads of great music from Benin can be found on his very active blog), a line-up of the Commandos is printed on the back of the sleeve. I am hoping to dedicate another post to guitarist/singer Cornaire Salifou Michel in the future, when I have sorted through these 45s. *I am still hoping to -one day- find a Chappotin recording which hasn't been posted on the fantastic Listen with my (or to your) ears blog. I especially thank you for this post and for my blog. Thank you also for the rich comments. very belatedly, is there a way one can get invited to that listentomyears blog? Or is it only for the upper echelon of African music specialists? I'm afraid I wouldn't qualify, but I sure would love to take a look around. I understand. I only thought you might have a way of getting in touch with this person. It doesn't even allow you to do that. Well thank you anyway.